LOS ANGELES (AP) — Michael Jackson's daughter, Paris, talks about her late father in an interview with Oprah Winfrey airing Sunday. 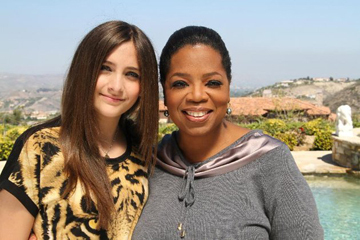 Paris Jackson, 14, will be featured on “Oprah’s Next Chapter,” the channel said Tuesday. She and Winfrey discuss how the teenager is faring three years after the 2009 death of her pop star father. Paris and her brothers, Prince and Blanket, were closely sheltered during Jackson’s life but have been in the public eye since, appearing onstage at Grammy Awards and on other TV shows. “Oprah’s Next Chapter,” which also will include an interview with Curtis “50 Cent” Jackson, will air at 9 p.m. EDT Sunday on OWN.